Several species of Funnel-Web Spiders (Family Agelenidae) are found here in the Sonoran Desert, and their distinctive, funnel-shaped webs are a common sight in areas with grass, leaf litter, and other plant debris. 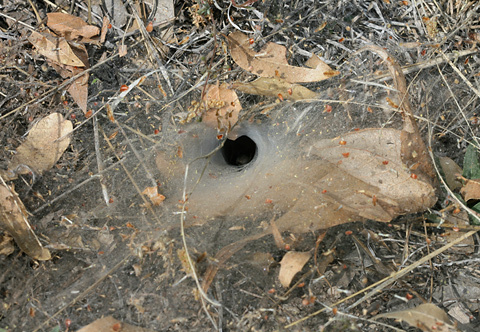 In early May of 2008, I observed this Funnel-Web Spider web in a patch of dry grass in Happy Valley, Arizona on the east side of the Rincon Mountains. Although it was most definitely still occupied, the web was a bit dusty and thus very easy to see. Funnel-Web Spiders build broad, funnel-shaped, generally non-sticky, horizontal sheet webs just above the ground. 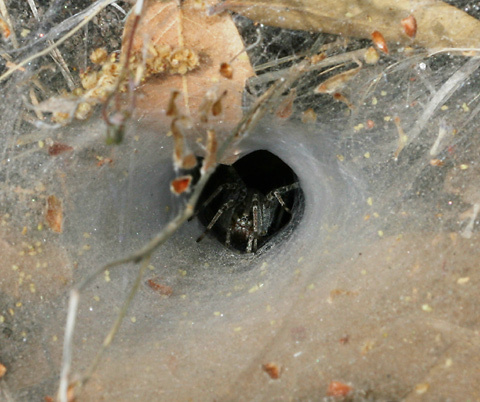 The Funnel-Web Spider hides inside the mouth of the funnel and waits for an unsuspecting insect to blunder across the web. When it senses the vibration of an insect walking across its web, a Funnel-Web Spider will race out of its hole and bite the insect, injecting it with venom. Immobilized by the spider's bite, the insect is then dragged back into the spider's lair, where it will be eaten. The Funnel-Web Spiders found in Arizona are harmless to humans and very shy. I rarely see them outside of their holes, and any that I do see outside will quickly race to the safety of their holes when they spot me. Fortunately, the owner of this web did emerge, which allowed me to get a photo of it. It was windy that day, and the dry, empty, white husk of a grasshopper blew onto the Funnel-Web Spider's web and lay there quivering in the breeze. 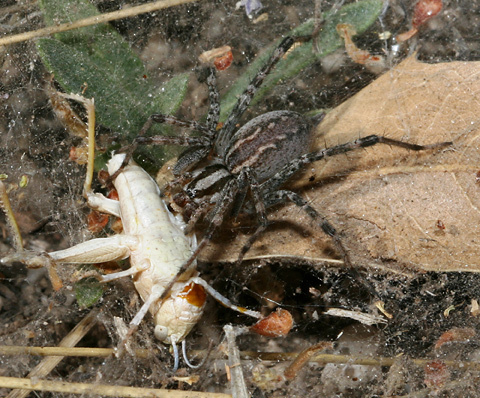 Sensing insect-like motion, the hungry Funnel-Web Spider eagerly galloped out of its hole and bit the grasshopper husk. Even though it had the proper insect shape, the grasshopper husk was not a nice, juicy meal for a spider, so the Funnel-Web Spider seemed rather disappointed with its "kill". The unhappy spider flipped and rolled the grasshopper husk around on the web for a while before giving up on it and returning to its hole to wait for something tastier to happen along. Note: The Funnel-Web Spiders found here in Arizona are not in the same family as the deadly Australian Funnel-web Spiders (Atrax robustus and Hadronyche spp. 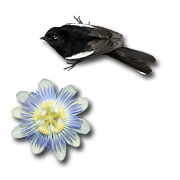 ), and they are not dangerous to humans or likely to enter houses. Our Funnel-Web Spiders are in the family Agelenidae, while the Australian Funnel-web Spiders are in the family Hexathelidae. Even though it is in the same family as our Funnel-Web Spiders, the possibly venomous Hobo Spider (Tegenaria agrestis) of the northwestern U.S. and western Canada is not found here in Arizona. Very similar-looking and also harmless Funnel-Web Wolf Spiders (Sosippus spp.) are also found here in Arizona, but they are in the Wolf Spider Family (Lycosidae).